We have a couple of favourite spots that are easily accessible. 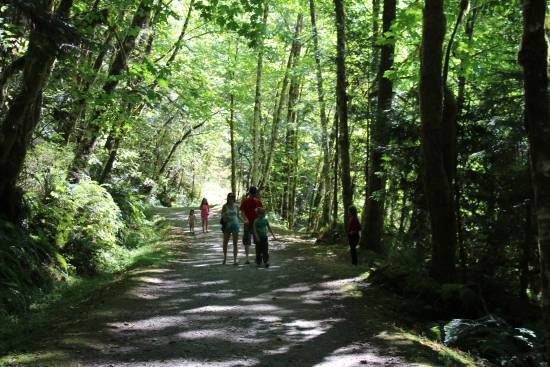 Our most recent visit was to Stamp River Provincial Park, tucked way out the end of the stunning Alberni Valley. The park has been one of those hidden jewels that is often overlooked by travelers – not because of access difficulty but because of its out-of-the-way location a few miles out of town. I hadn’t visited there for upwards of 40 years but found that, other than some minor upgrades that have definitely added to the park experience, it is as pristine and magical as ever. 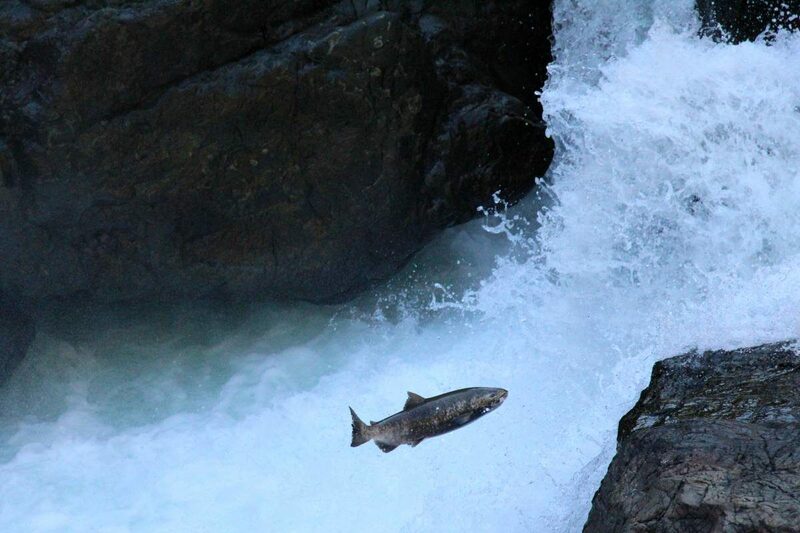 The Stamp River is a major spawning site that attracts 40 million salmon, lampreys and other fish each year. The spawning runs generally begin in August and continue into December. 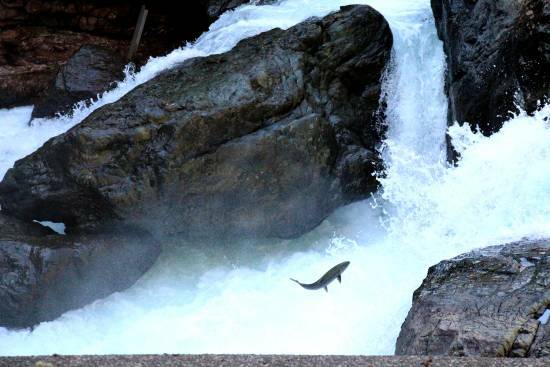 Inevitably, the battle of the fish to traverse the 9 metre (30 foot) falls is a great attraction for folks of all ages – adults strive to catch the action on camera while youngsters ‘oooh’ and ‘aaah’ as the valiant and mesmerizing migration takes place before their eyes. 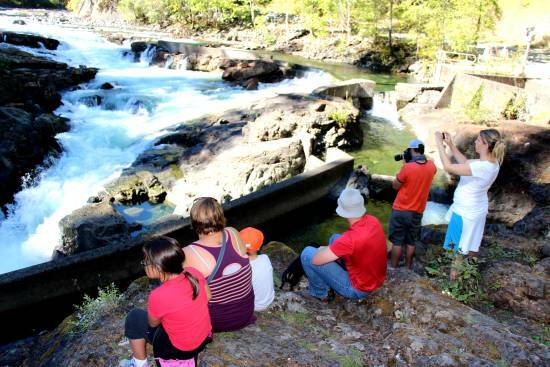 There is a series of fish ladders that was built in the mid-1950s that is used by many of the fish, and underwater cameras at the site project onto a trail-side television screen, allowing visitors to view the journey through the fish ladders too. 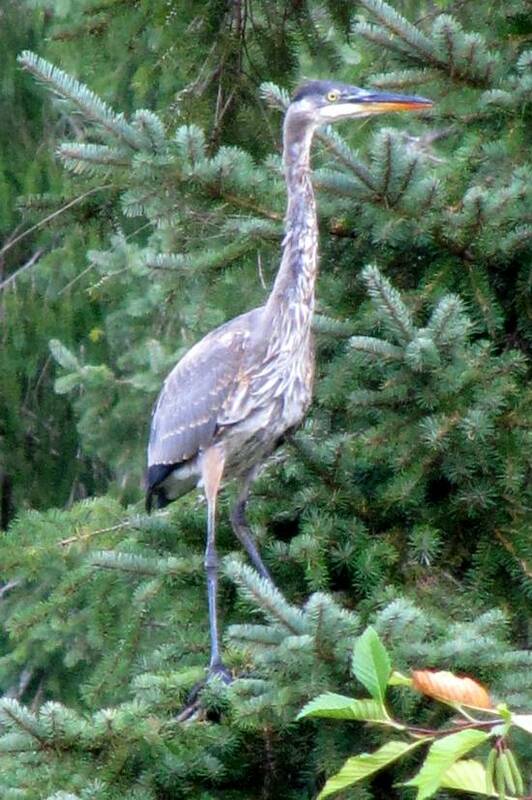 One of the added bonuses to be found in the 327 hectare (808 acre) park is the wide variety of other wild life. 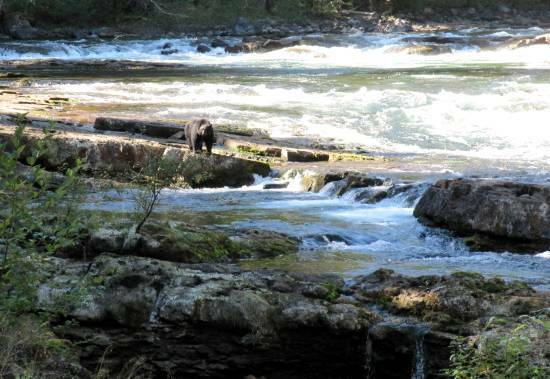 During our recent visit we were delighted to see a black bear amble along the riverbank (far side, thankfully) and end up just below us, hovering on the rocks and hoping for a fresh fish lunch. In the end he decided his position perched above a quiet pool was too precarious and he trundled off into the woods, But the whole experience brought to mind the old children’s song predicting that ‘if you go down to the woods today, you’re in for a big surprise’. Mr. Bruin was, indeed, a big and most delightful surprise. 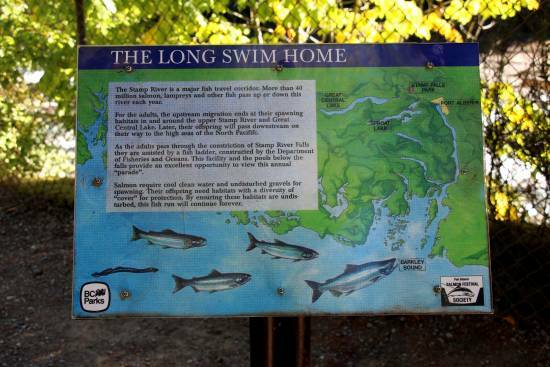 In addition to the many excellent interpretive signs at Stamp Falls there is a small network of well-maintained walking trails (two kilometers or 1.2 miles) that leads to the quiet pools below the falls where the salmon congregate prior to battling their way up-river. 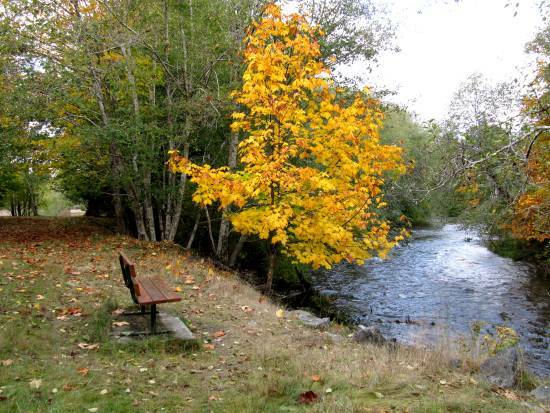 Another of our favourite spots for succumbing to the ‘call of the wild’ is at the Little Qualicum spawning channels, located just outside the town of Qualicum Beach. The man-made channels and small fish ladder complex there are part of a steelhead recovery plan and a watershed restoration project, so there is much to see and enjoy. Trails meander all over the place – along the riverbank, over metal bridges that span the channels, and through pretty woods and meadowland. The trails are well-maintained and wide, easily navigated on foot or bicycle. Visitors can abandon their vehicles in the large, paved parking lot and enjoy an engrossing hour-long ramble that will yield up views not only of fish, but of Great Blue Herons waiting patiently for a meal, occasional black bears and, sometimes, very intermittently, cougar. There are, of course, many other places on Vancouver Island to marvel at this ancient and perennial rite of wild creatures. No matter where we decide to take it in, the memories of sunshine, fresh air, wildlife and the forces of nature sustain us when autumn has long since bid adieu. Want to check out après-ski activity at BC's ski resorts? Read on to learn about everything from ice climbing at Big White to the Ice Bar at Fernie. Muscles aching after a day on the slopes? BC boasts several hot springs close to ski resorts and backcountry ski areas, including along the Powder Highway. Check out these things to do in BC that range from free to $150 each. Want to recharge? These 10 BC hot spots are sure to restore your energy. Where to see seasonal festive holiday lights in BC. Vancouver, Whistler and Victoria. Butchart Gardens, VanDusen Gardens, Grouse Mountain, Olympic Village.